I am not a wimp but my gut isn’t what it used to be. 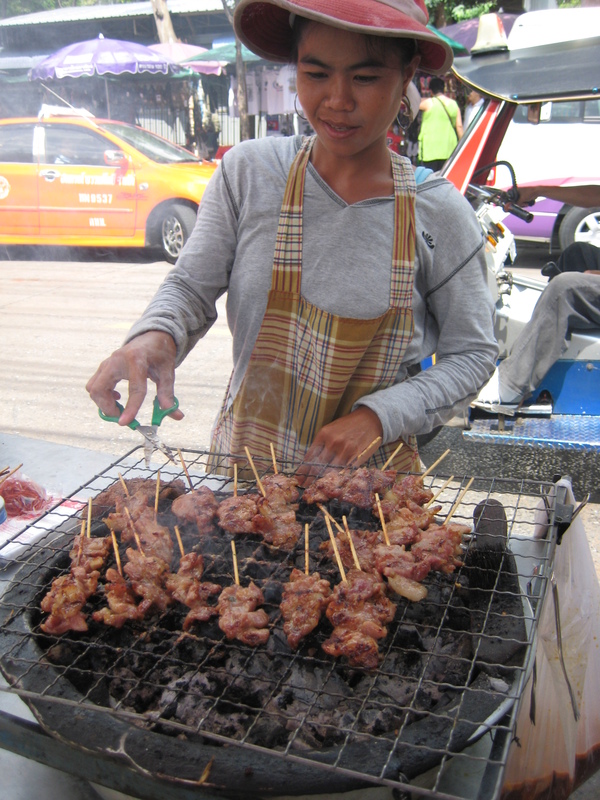 I went to Bangkok with EVERY intention on actually eating food off street stalls because they are often very tasty and authentic. Some of my best memories of eating throughout Mexico were the dodgy-looking tacos, ice creams and grilled corns from street stalls. 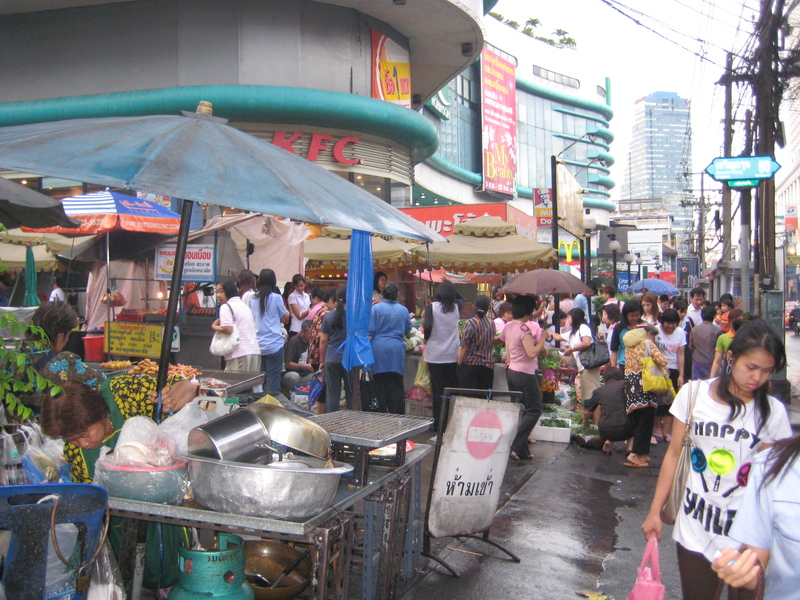 The main reason why I didn’t eat at many of the stalls in Bangkok is because of the absolutely scary and appauling food-safety conditions. 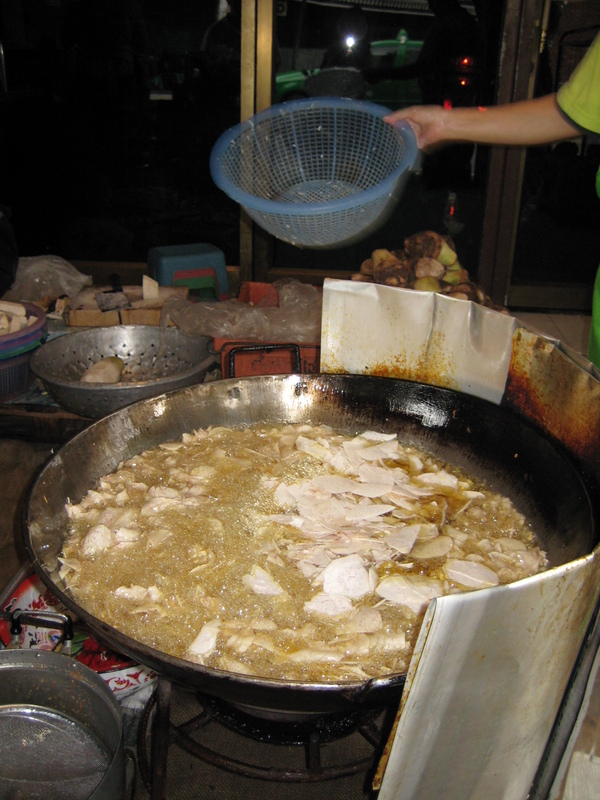 Let me remind you that it was very hot, (over 35C and over 90% humidity) and it was rainy season and so often, I’d walk by street stalls with bowls of meat sitting out in the hot sun for god knows how long!! Or, if it looked decently clean, I’d see the bucket of stagnant water that they were washing their crockery and cutlery in (not to mention they reuse wooden chopsticks) and realized that they didn’t refresh the washing water very often. Yuck! Also, because it was the very beginning of my around-the-world trip, I honestly didn’t want severe gastro problems so early on (especially since my next flight was 13 hrs to London). I made a rule for myself that I would only eat something at a street stall if it wasn’t on washed crockery and only if it was piping hot when I purchased it. So, grilled & marinated chicken skewers qualified under that category and they were awesome! So juicy and tasty and it cost about $0.20 each and they were piping hot off the grill. One of the things that I couldn’t resist buying were cold drinks and fresh juices from the street vendors, especially during those scorching days. We bought thin popsicles, frozen in the most interesting manner (see picture) to refresh ourselves and the Thai iced tea flavor popsicles were fantastic! We also ate a lot of sweets off street stalls – among them, grilled sticky rice and banana wrapped in banana leaf and fried peanut crackers. Popsicle freezer...ingenious especially since it was so hot out! Some of the tastiest and juiciest chicken skewers! 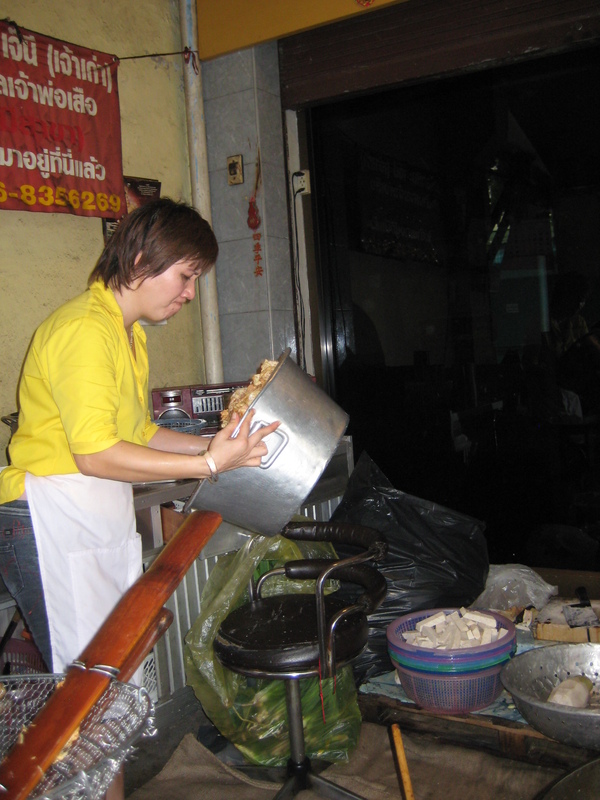 At the Chatuchak weekend market, a noodle stall almost called me to sit down because it looked really good. In the middle of each table, there were large mounds of shredded cabbage and other vegetables piled in bowls and wondered what it was for. 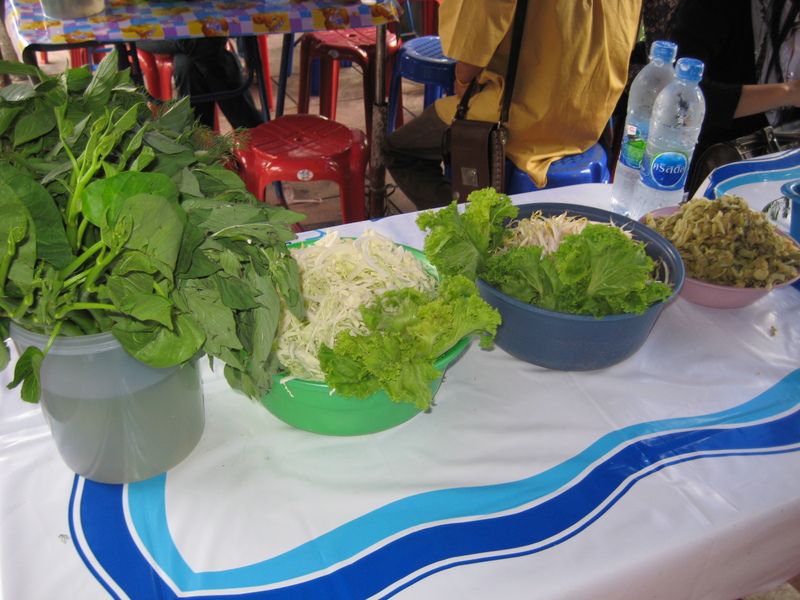 I soon saw that the raw veggies (as much as you like it seemed) were to be added into your hot soup (kind of like Pho). Problem was, they offered NO tongs so that diners were licking their forks and then diving into the veggies and double-dipping! New bowls of veggies weren’t provided to the next customer – they were simply refreshed with more veg. 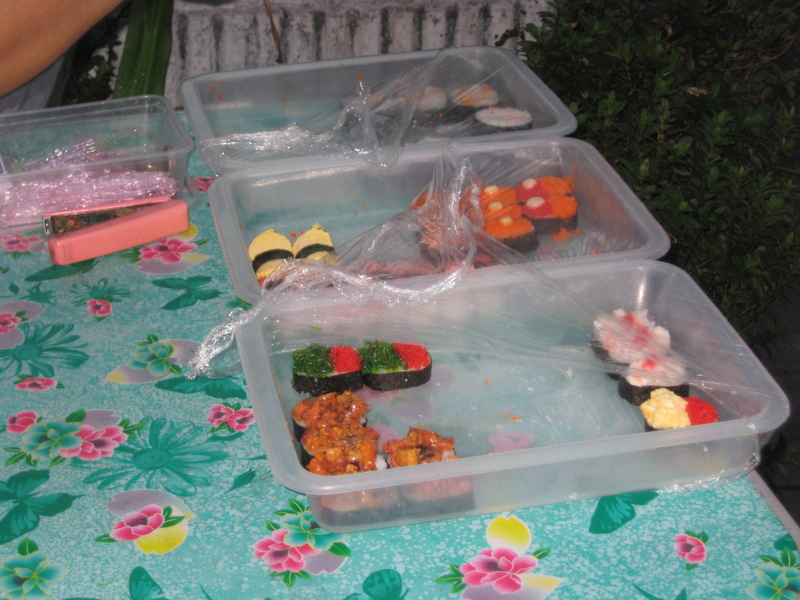 One of the scariest things I saw being sold by the side of the street was sushi. 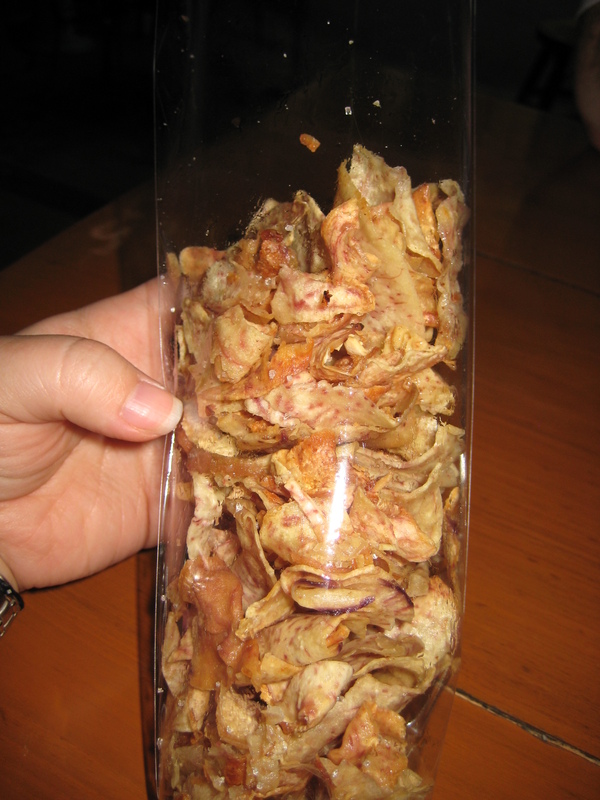 It looked entirely homemade, in a large tupperware container and sold with ZERO refrigeration. 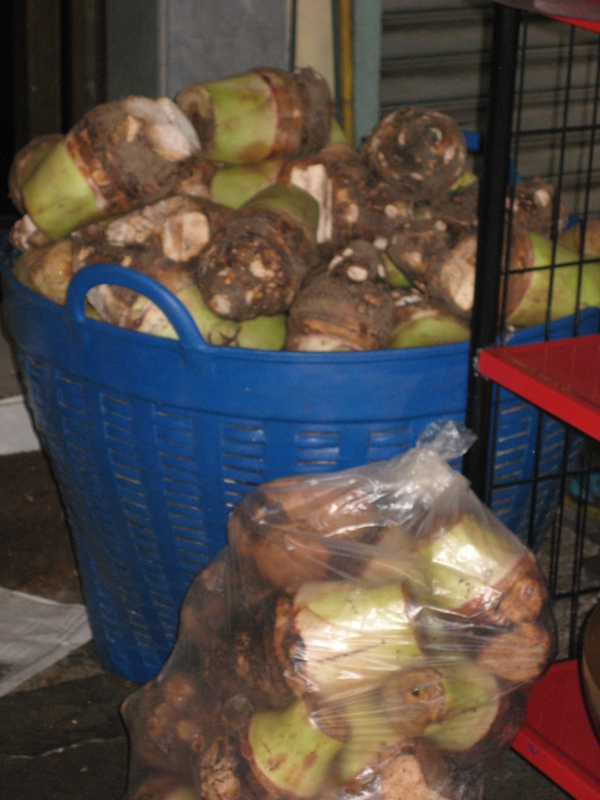 People were still buying them from the vendor and that really amazed me. 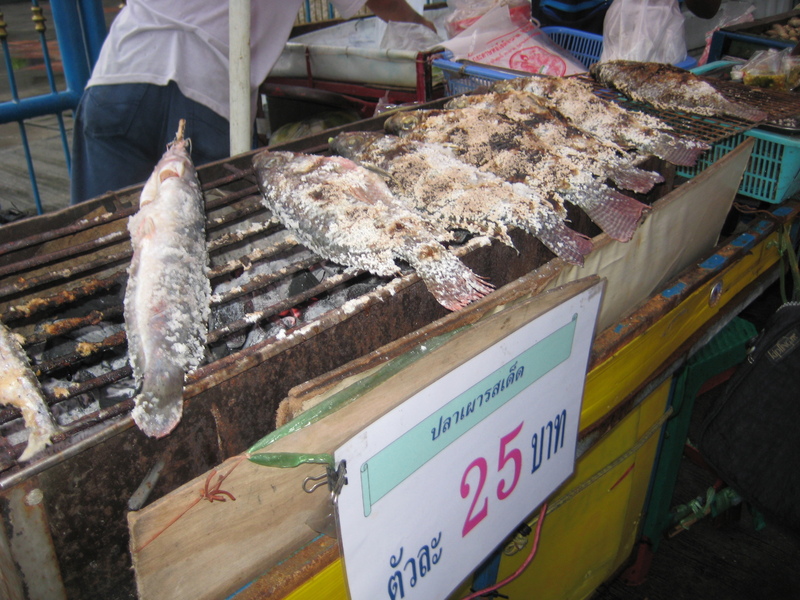 The average Thai person must have very different flora in their gut to be able to withstand all the gastrointestinal onslaught from foodborne diseases! 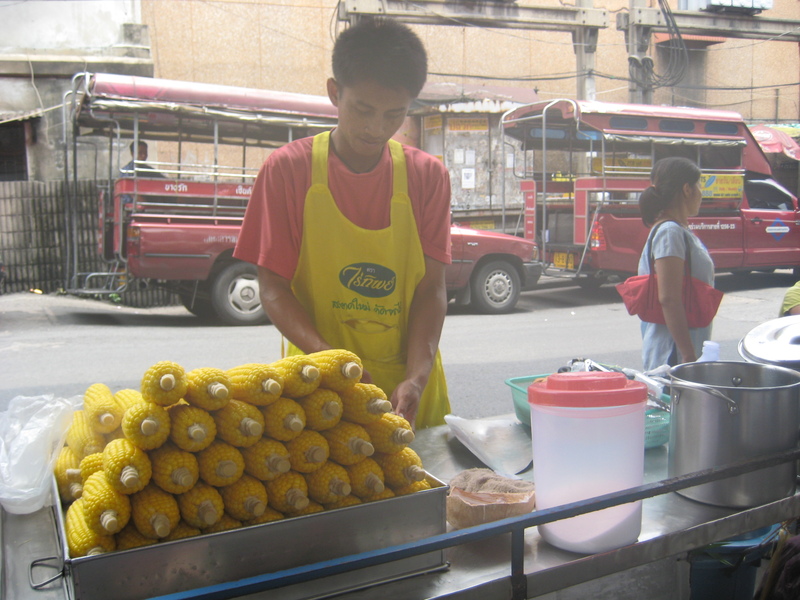 This photo was taken on a random street in Bangkok on our search for Chote Chitr restaurant (reviewed on NPR and NY Times – story on that later), it was very near to the restaurant on the main road. 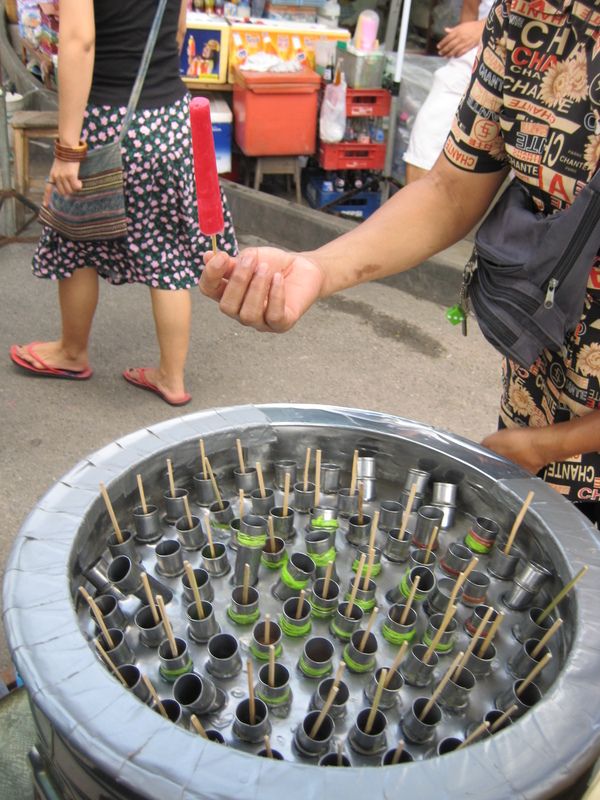 Although the weather was scorching hot and humid, I just couldn’t pass by these hot treats because they invoke a lot of childhood memories for me. 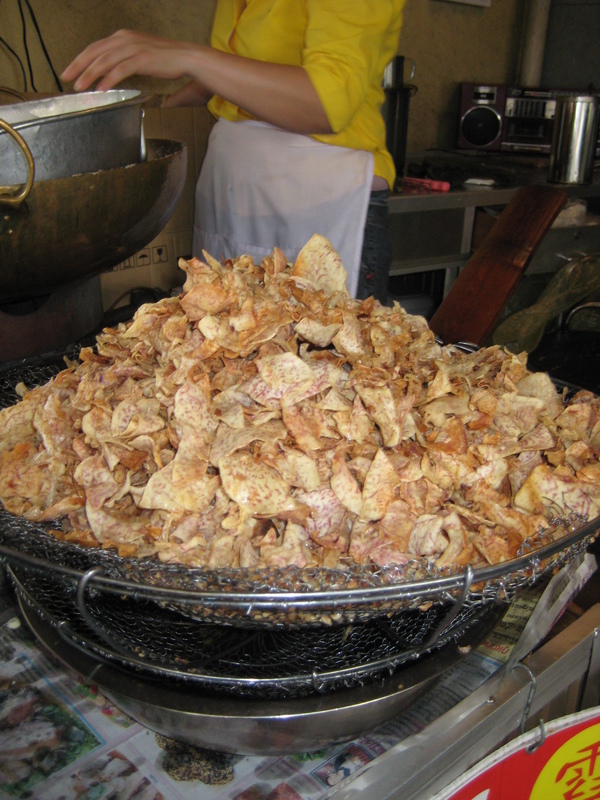 I have actually never had taro chips “hot off the fryer” and it was amazing to me that they had this type of set-up outdoors (but then again, they cook anything by the side of the street in Bangkok). I bought two bags for the total of about $1.30USD. The woman tossing the chips was very grumpy and unfriendly but who cares, it was all part of the experience!